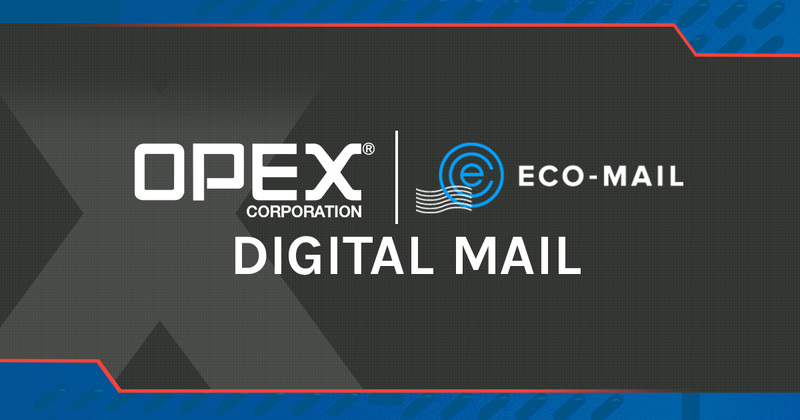 NEW YORK, April 11, 2019 — OPEX Corporation, a recognized global leader in innovative scanning and mailroom automation technologies, and Eco-Mail, a leader in supplying digital mail solutions, have partnered to provide an industry-leading digital mail solution to one of the top three banks in the United States. The solution will eliminate virtually all distribution of inbound paper mail for this multi-national bank, while modernizing data extraction and workflow processing throughout their lines of business. OPEX® and Eco-Mail have delivered a digital mail solution that uniquely addresses the full range of pain points - spanning all mail types across all departments. - Enhances audit & compliance controls. Within many industries, delivered mail remains a significant source of business-critical communication. The annual volume of first-class mail delivered in 2018 exceeded 56 billion pieces. In otherwise modern and digital organizations, inbound physical mail continues to drive significant cost, risk and inefficiency. Maller continues, “The net result is a data-driven platform for paper mail, enabling the benefits of digital transformation that organizations demand from every segment of their business.” By working with OPEX, Eco-Mail was able to create a seamless bridge between physical and digitized mail, reduce prep time, enhance mail tracking and tightly integrate the hardware and software solutions. “OPEX’s dedicated FalconRED® dramatically increases the efficiency of opening and scanning mixed mail types,” notes Maller. As businesses worldwide strive for digital transformation, and as the definition of the traditional office is redefined, the costly process of physically sorting and delivering mail is being replaced by technology-driven digital mailroom solutions. This combination of OPEX and Eco-Mail provides organizations the flexibility to quickly route vital paper-mail-based information to decision makers with the speed and efficiency of digital.